Once again, our team is coming across the ocean to share our best experiences with you. We have spent over 14 years taking care of our customers, mostly through FileMaker solutions. On our journey we have had to cross many boundaries. We crossed country borderlines both physically and over the internet to reach to customers around the whole world. We had to escape from our mindset boundaries and come up with out-of-the-box solutions for zillions times, often helping our customers to do the same. We have been extending boundaries of the FileMaker products through plug-ins, and boundaries of the software in general by integrating various hardware devices. Finally, we have succeeded many times to push boundaries of technology by optimization, helping our customers to improve performance of their software, productivity of users, and efficiency of their business processes. 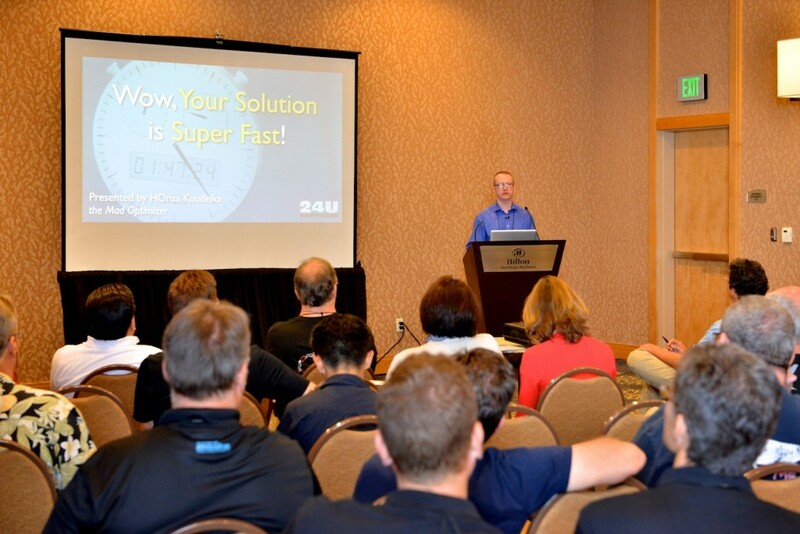 24U is ready to help you to identify software-related issues, design a solution, implement the solution, and train your staff so you can stay happy with your software in a long term… Come to see us at the FileMaker Developer Conference 2014 and discover how we can help you to leverage the FileMaker Platform to run your business without boundaries. 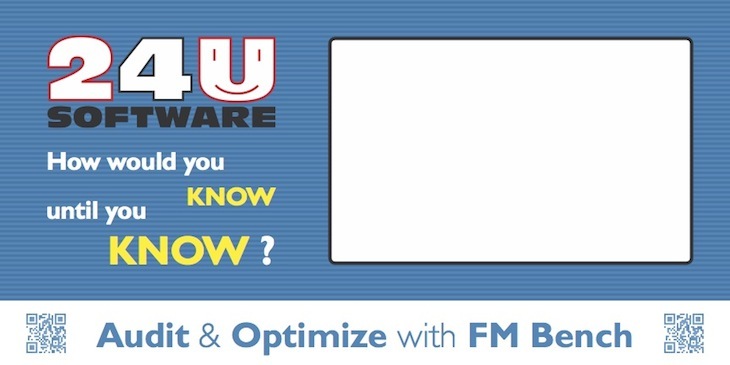 Find us easily by looking for this banner: Come to visit our booth on DevCon and we’ll get your software solved to let you focus on your business! Do you wonder how the performance of FileMaker 13 products compares to the previous versions? Are you curious how fast you can develop with FileMaker Pro 13 Advanced? Do you want to spend less time hunting and fixing bugs in your solution? How would you know until you know? You can guess and work like blind in the dark, or you can audit, and then optimize your code, your processes, and your customer’s processes. Learn how to “Develop fast, work fast, have fun (not only) with Filemaker Pro 13”.This is the topic HOnza Koudelka is going to talk about on Tuesday 29th of July at 3:45 PM in the Periwinkle session room. During this session, HOnza will show you a FileMaker 13 solution you have never seen before. You will find and fix a bug in the solution, optimize the solution to perform faster, develop a new feature, and make users of the solution become more efficient. Are you ready to have fun doing all this hard work? All this will be done directly at DevCon! Are you ready to have this kind of fun? No matter if you attend our session, or just come to see us at our booth, we look forward to seeing you in San Antonio!